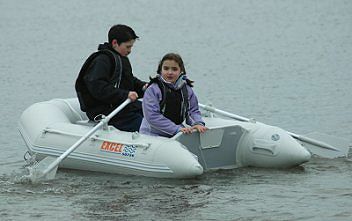 Inflatable Boat Accessories & Options from Excel. I would just like to thank you for the excellent service you provided when I purchased an SD290 from you on wednesday morning. I was amazed at your speed in delivery and the professional and courteous manner in which you conducted our business over the phone. I wouldn't hesitate in recommending your company to anybody and I would like to thank you once again. Yours sincerely, Peter Wearden. * SD160/180 - SL200/230/260 - RT230/260, models do not include Keel. To view a gallery of Excel Inflatable features - Click Here..
SD230 - Procedure to deflate and pack into carry bag - Click Here..
Painter; Self Bailer; Oars with Row Locks or Paddles; Carrying Bag/s; Hand Pump; Repair Kit; Inflate/Deflate Valves; Thwart(s). SD- Patented high pressure air deck. SL- Lite integral floor. RT- Round tail with engine bracket. XHD- Aluminium composite sectioned deck. SD160/180 - SL200/230/260/290 - RT230/260, models do not include Keel. All models take short shaft outboards except XHD535, XHD595 and XHD705 which are long shaft. HYTEX 1690/ 1.2mm heavy duty fabric is available as a build option for certain models. All business is subject to our standard terms and conditions, copies on request. Prices are correct at 01/04/2017 but may vary due to fluctuations in exchange rates. Pricelist includes VAT - 20%. E&OE. * All business is subject to our standard terms and conditions. Copies available on request.